You have trouble maintaining a planner or agenda for recording assignments. You have trouble planning long term projects and often complete them at the last minute. You often forget papers, notebooks and other materials needed for school or homework. You have a hard time estimating how long a task or project will take. You have trouble starting your homework independently. You have a hard time keeping track of your possessions and often lose important materials. You have trouble listening to and following multistep directions. You have trouble transitioning from one task to another. You have trouble keeping appointments. You have trouble keeping your bedroom and bookbag organized. What are Some Common Myths and Truths? Myth: Kids with executive functioning weaknesses are lazy and unmotivated. Truth: Most of these kids are motivated and hard-working, but they have trouble maintaining attention and stamina. As a result, these students are often misread and misunderstood. It is important to realize that weak executive functioning skills are NOT the result of laziness, lack of effort, or carelessness. In fact, criticizing these learners and providing negative feedback and pressure often worsens these difficulties and can trigger feelings of helplessness. Myth: ADHD and executive functioning issues are the same. Truth: Attention is only one small piece of the executive functioning skills that the brain performs. Therefore, some kids with executive functioning challenges do not have ADHD. Likewise, there are some kids with ADHD that do not struggle with other areas of executive functioning such as planning, time management and organization. What the research is discovering, however, is that there is a positive correlation between those with ADHD and executive functioning disorder. 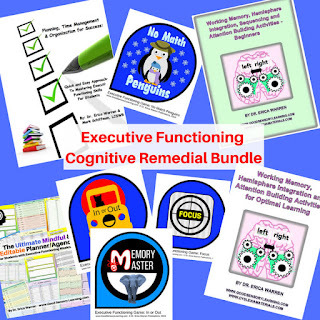 Myth: All kids should be able to learn executive functioning skills. Truth: Just like some kids are blind or paralyzed, other kids have learning disabilities that make executive functioning extremely difficult. In fact, some individuals have such a difficult time with executive functioning skills, they require support from technology and people (such as personal assistants or secretaries) throughout their life. Myth: Kids can't get school accommodations for executive functioning problems. Truth: With proper testing, many of these kids are diagnosed with a learning disability or ADHD. With a diagnosis, students can get an individualized education program (IEP) or 504 plan that can offer reasonable accommodations. What Can be Done to Assist These Capable Learners? 1. Maintain a structured, daily routine. 2. Teach them how to set priorities. 3. Generate a consistent homework plan. 4. Break large assignments into manageable tasks. 6. Demonstrate time management skills by generating self imposed deadlines. 7. Teach study skills and test taking strategies. 8. Provide incentives and positive reinforcement. 9. Utilize graphic organizers for planning ideas and writing. 10. Teach metacognitive skills by thinking through thought processes aloud. 11. Be patient and supportive. Where Can I Get Ready Made Materials and Exercises that Help Develop These Skills?